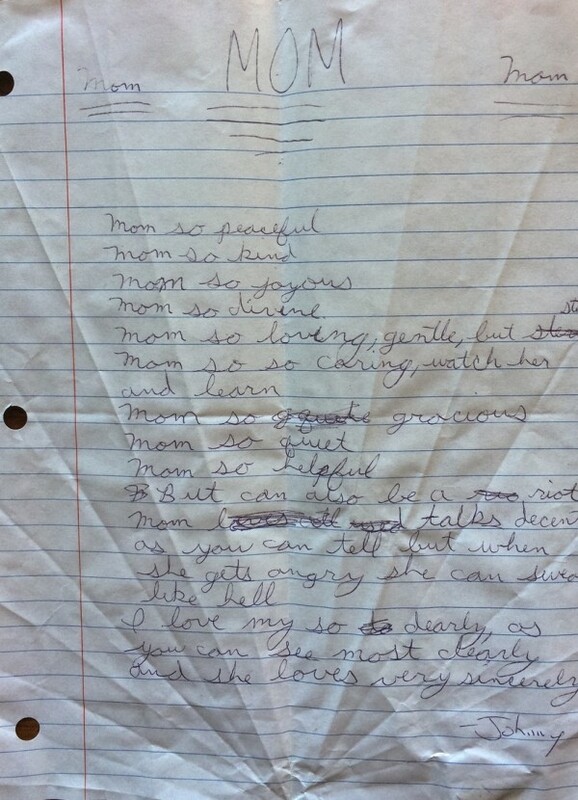 These words are the first four lines of a Mother’s Day poem my oldest son wrote me back in 2007 when he was 13 years old. Is there any greater gift than a homemade card with heartfelt sentiments from your child? As mothers, receiving such a touching memento of expression energizes our mom heart in profound ways. Admiration from our kin can even catapult us to the top of the “I must be doing something right” pyramid of parental standards. Even a tiny bit of innocent and angelic honesty stirs our soul and breathes life into our often worn out spirit. And if we need a boost of mom-esteem and parenting confidence, reading crayoned and misspelled words that declare how much our kids love us is, well, better than chocolate. Which is why I’ve saved countless cards and letters written by fingers of many shapes and sizes over the years. Each masterpiece reminds me how blessed I am to be a mom who’s loved by kids and has kids to love. My teen made sure to sneak in a reminder of his displeasure towards my strict ways between the bookends of loving accolades. A shining example of his cleverness and poetic wit. At thirteen, he had progressed from backwards s’s and e’s to testing the written guiles of independence. Which is a good thing, for sure. If your teen points out you are stern in a Mother’s Day poem, pat yourself on the back because you are doing something right. Being our teenagers friend during the turbulent years of testing limits isn’t in our job description. Our role is to set healthy boundaries so their undeveloped frontal lobes—which prevent them from seeing beyond the now—don’t lead them down a rabbit hole of trouble. Heaven help us, Alice in Wonderland. Yes! Another healthy dose of mothering attagirls heaped on my tender spirit by my teenager. 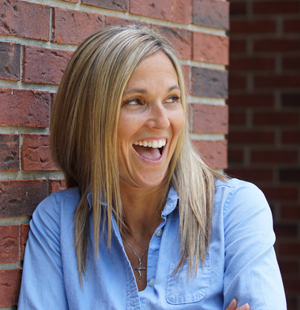 If your teen finds humor in your relationship, consider the muse a great necessity. Because laughter is sometimes the lone elixir available to save you both from burning to death when you find yourselves in the depths of hellish arguments. If you can’t beat ‘em, laugh. Then cry. Then pray. Oh, wait. Always pray first. Rinse. Repeat. With insides dancing in joy over my son’s appreciation of my funny bone nature, I scanned down to the next stanza of the poem. Doing so reminded me at once how all good things must come to an end. My oldest son is bold and makes no qualms about speaking his the truth. And in the case of his Mother’s Day poem, he pointed out a truth in love, thanks to stellar parenting on my part. I guess. You’re welcome, son. Nothing like a gentle slam tucked inside a flutter of flattery. I wasn’t sure whether to laugh, cry, or stack rocks after experiencing the privilege of having such a weakness therapied out in an adoring poem from my child. 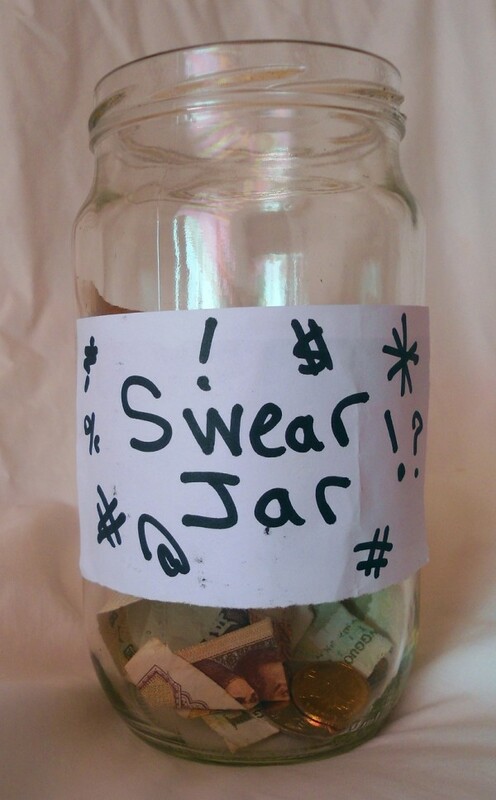 Listen, people, raising teens sans swearing is Ghandi-ish and, of course, Christ-like. Apparently, I was neither during the teen years. While I always strive to put my best Jesus foot forward, the tumultuous season shoved my potty mouth backwards. Which brings me to the importance of taking an inventory of our less-than Christ-like behaviors. Starting with believing something is a spade when someone calls it one. Especially if that “something” is worthy enough to find homage in our kid’s Hallmark holiday poem. Then we need to take heed and put a fork into any hope of our mothering faults slipping by unnoticed. In my case, recognizing my poor behavior was poem-worthy left me a bit dazed. For as fast as my son’s previous sentiments sprung me to the peak of mothering Everest, his gregarious poke sent me back down the rocky terrain towards death by pride. And God no doubt thunder clapped me to victory, because every descent of self creates opportunity for a humble ascent of character. Though reading about my swearing prowess gave me all the negative feels a decade ago, I knew the spiritual death of my untamed tongue would plant a seed for the resurrection of something holier and whole. Ah. New life and a chance to find my way to the summit of healthy mothering. Regardless of how life pans out, the most important thing for us as mothers is that our kids know without question how much we love them. Period. None of us will ever be perfect. God knows I’ll be as real as real gets until the day He calls me home. But, as long as my kids never doubt my love, all is well with my soul. Keep it real in love, crazy Mommas!